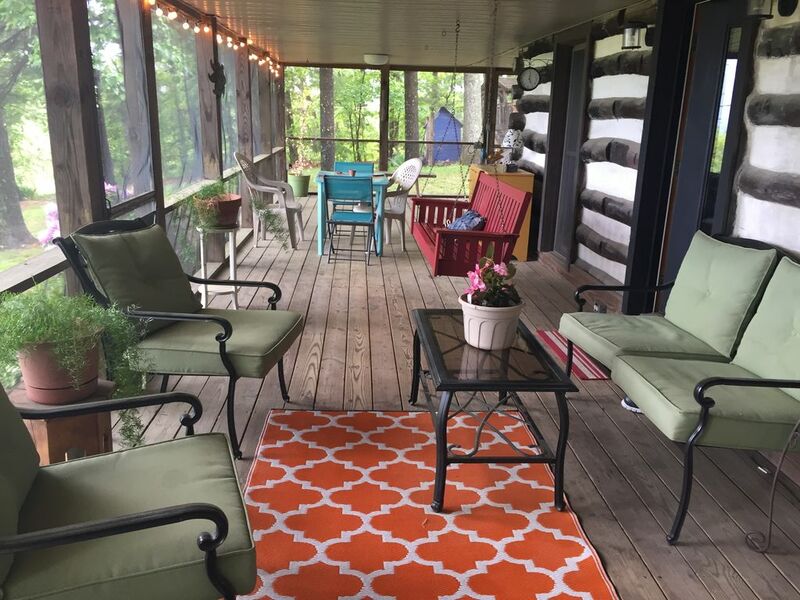 Sit a spell on the porch swing and enjoy the beautiful view or snuggle up to the fireplace on a cool evening. This large country home is spacious and cozy. Three large bedrooms in addition to a large loft (with bunkbeds and a sleeper sofa) plus three full baths allow for your family to enjoy a relaxing, comfortable stay on a lovely hilltop just outside of Gettysburg, PA. You'll find the kitchen to be fully appointed with all your needs for family meals. All linens, towels, and paper goods are provided. We bought this property in 2004 and have lived here as a family until 2015. We enjoyed raising our children in a quiet place surrounded by nature. The second we pulled into the driveway, we knew it was our future home. The charm and the view first drew us in. This has been a quiet place for us to unwind with our friends and family. It's a great property for entertaining and all who come here seem to immediately head straight to the porch. Beautiful views of Adams County from the porch swing on the screened in front porch! Cozy fireplace and nice quiet evenings. Towels, toilet paper, tissues and hairdryer provided. All dishes and utensils and items you will need for your stay. Island seating for four and dining room table with seating for four. Sit on the front porch and enjoy the cool mountain breeze and enjoy one of our books from the library. Great collection of family favorites and of course "Gettysburg"
We had a memorable cousins getaway. The property had every comfort we could have asked for. Very clean and neat. Obviously well loved and cared for, attention paid to every detail. We hope to go back again. This is our 3rd year at this house and I am sure there will be many more! There are 3 couples that go and the first year, we did all the "tourist" things in Gettysburg and mainly just slept at the house. After we left, we all agreed that we would have liked to have spent more time at the house because it is so warm and comfortable. This year, I think we spent 4 hours in Gettysburg and the rest of the weekend just hanging out at the house - eating too much in the huge kitchen, sitting in the leather chairs in the log cabin room with the fireplace, and laughing around the fire pit. If you are looking for a house that gives you the best of both worlds - relaxation and a million things to do just a short drive away - this is the place! We had a great time in this spacious and comfortable home. Laurie answered my questions so quickly. Thank you! We had a fantastic stay at this property! We had a fantastic stay at this property! The house was as beautiful, if not more so than the photos. The children loved the loft. We came to ski at Liberty, about 20 minutes away, and enjoyed coming "home" to the gas fireplace after skiing and tubing. We had a great time and hope to return. My friends and I really enjoyed our stay at this house for our winter getaway. The location was great: far enough out in the country to enjoy the scenery and feel like an escape from everyday life, yet only about 10 miles away from Liberty Mountain in one direction and Gettysburg in another. The house is very comfortable and had plenty of space for our group of 5. The kitchen had everything we needed to enjoy cooking some good meals. Laurie was very responsive to any questions that we had and her husband came to clear the driveway when the snow and ice piled up, which was a huge help. We would definitely come back and recommend that anyone staying here also visit the Halbrendt Winery which is a short walk away. We loved our new years stay here. Laurie was very easy to work with even letting us know about where the fireworks were going to be. Plenty of room for the 6 of us. It had that log cabin charm that we wanted while being modern and comfortable. We would love to come back in the summer when we can use the screened in porch a little more. Overall great stay and would highly recommend. Our home is located on a beautiful mountain vista just off Old Rte. 30 overlooking Historic Gettysburg. Old Rte 30 was used by General Robert E. Lee and the Confederate Army on their way into Gettysburg. The Cashtown Inn Restaurant is located just below the property. We are just a short drive to the battlefield, local wineries, restaurants, Appalachian Trail, Caledonia State Park as well as other area activities and attractions.